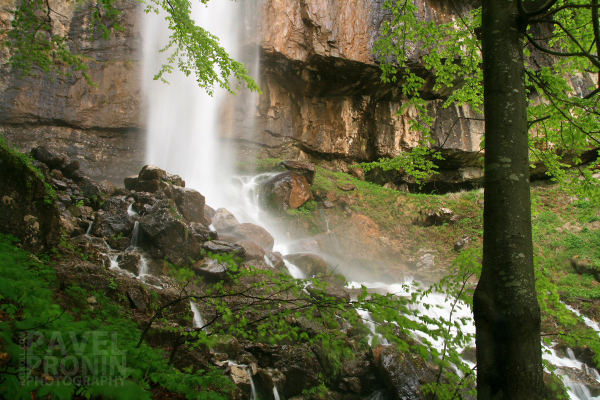 The picturesque waterfall is located in the Natural Park Vratsa Balkan southwest of the village Zgorigrad. The waterfall is 63 meters high. The area is named after the black pines growing there, which according to most scientists is the only natural habitat of this species in the mountain. The waterfall is fed by the springs of LevaRiver, which are located at a 200 meters distance from the waterfall. The first stage of the Vratsa eco-trail leads to the waterfall. The trail is not difficult, but we recommend you not to go there in winter, especially if you do not have the necessary equipment. In any case, you should go with comfortable hiking shoes, spare clothes, packaged food and eventually walking sticks. The eco-trail starts from the village of Zgorigrad – located about 6 km. south of Vratsa. At the end of the village of Zgorigrad there is a creek on the left and a not very large lawn, where you can park if you are by car. Then you should turn left along the river. After a few minutes walk you will see the onset of the eco-trail that follows the Leva River along the slopes of the Vratsa Balkan. Amid the background of river gorges and rapids a system of bridges and stairs leads to the Pine Stone Waterfall. Then the trail goes behind the water wall and climbs up the cliff to the top of the waterfall where you can enjoy a magnificent view. The displacement of the eco-trail is 700 metres; the distance is about 3km. and can be achieved for 2 hours walk with normal pace. Further, following the river bed you will reach a large and beautiful meadow suitable for recreation. From the meadow you can also head to the mountain hostels Parshevitsa or Okolchitsa.